MS Dhoni's calm and composed innings helped India win its first bilateral ODI series Down Under. With the series tied at 1-1, India took on Australia at the Melbourne Cricket Ground on Friday. Indian skipper Virat Kohli won the toss and decided to field on a slow MCG pitch. Indian bowlers justified Kohli's decision to bowl first by dismissing Australia for a modest total of 230 runs with Yuzvendra Chahal being the main wrecker in chief as the leg-spinner finished with six wickets. For Australia, most of their batsmen got off to a good start but apart from Peter Handscomb none of them managed to make it big. Chasing a tricky target of 231 runs on a slow pitch, India lost both its openers cheaply and were struggling at 59/2 in 17 overs. 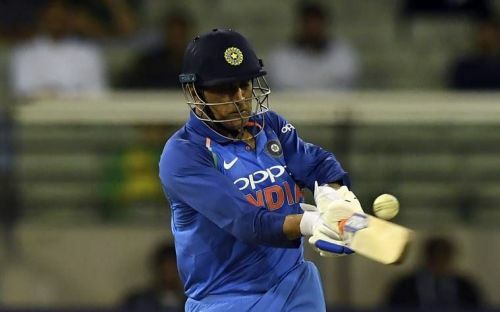 However, a crucial 46 runs by Virat Kohli and half-centuries from MS Dhoni and Kedar Jadhav helped India chase down the target of 231 runs in the last over. With the series done and dusted, let's see how the players from both sides fared in the third ODI. 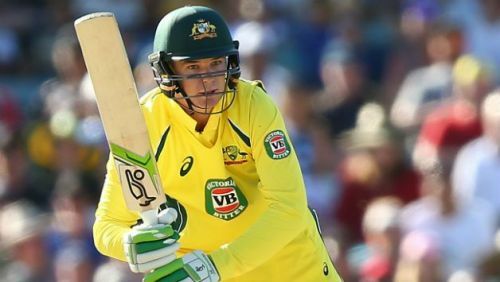 Peter Handscomb helped Australia recover from a middle-order collapse. The Australian skipper's poor run with the bat continued as he was dismissed for 14 runs by an incoming delivery from Bhuvneshwar Kumar for a third consecutive time in the series. Just like his skipper, wicket-keeper batsman Alex Carey was once again dismissed cheaply by Bhuvneshwar Kumar for just 5 runs. As has been the case in the whole series, Usman Khawaja once again got off to a good start but failed to convert it into a big score and was dismissed by leg-spinner Yuzvendra Chahal for 34. Coming into the game on the back of a superb century at Adelaide, Shaun Marsh looked good in the middle once again and scored 39 runs off 54 balls before being dismissed by Yuzvendra Chahal in the 24th over. The 27-year-old was the best Australian batsmen on display as he scored a fine half-century and also stitched together some crucial partnerships to help Australia post a fighting score of 230. The Australian all-rounder failed with the bat as he was one of the six victims of Yuzvendra Chahal and was dismissed for 10 runs. Stoinis also did not have a good day with the ball as he bowled an expensive spell of 9.2-0-62-1. Coming into bat after the dismissal of Stoinis, Maxwell started playing his shots from ball one and scored a quickfire 26 runs from 19 balls. However, Maxwell's attacking approach eventually led to his downfall as he was caught at deep fine leg boundary by Bhuvneshwar Kumar off the bowling of Mohammed Shami in the 35th over. The young pacer was the best Australian bowler in the match as he bowled a fine spell of 10-1-27-1, which also included the prized wicket of Virat Kohli. Richardson also showed that he is no mug with the bat as he scored 16 runs off 23 balls. The leg-spinner had a decent match as he conceded just 34 runs from his 10 overs but failed to pick up a single wicket. The experienced pacer's poor series continued as he once again ended up with an expensive bowling spell of 9-1-56-1. Replacing an injured Jason Behrendoff, the tall Billy Stanlake failed to pick up a single wicket in his 10-over spell. However, he troubled the batsmen with his pace and bounce and was also unlucky on the night as Handscomb dropped the catch of Kohli off his bowling.